Disney proudly presents the 50th anniversary edition of a spellbinding and beloved animated classic. 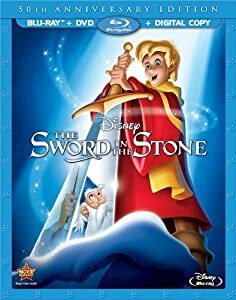 Conjure up magical family fun with the humor, adventure and Academy Award®-nominated music (Best Score ­ Adaptation or Treatment, 1963) of The Sword in the Stone now on Blu-ray Combo Pack for the first time ever! I have always been fascinated by the story of Arthur and Camelot and it only makes sense that in all of his Wisdom that Walt Disney and the Disney corporation would too. I mean bring together knights, history, magic and so much folklore, where else would they be. I remember seeing this movie for the first time and being completely drawn in by both the characters and the story itself. Seeing it again after a number of years in the new Blu-ray format was a great experience and I have to say that Disney again did it right and brought out the best in the movie not for a new generation. My family and I watched this together and I simply adored watching my daughters' eyes as they got into this film. They were completely entranced and afterward we talked about the folklore and the stories about Camelot and Arthur. After that the next time we went to our local library, guess what they wanted to look for - you guessed it - the same stories and folklore. Disney has done a great job with this movie and whether you have seen it before or not, this is definitely a movie that I highly recommend!